A beautiful upper level 3 bedroom, 2 bathroom condo with views of Whitefish Lake from the large wrap around deck situated beside the stream in beautiful Mountain Harbor Resort. 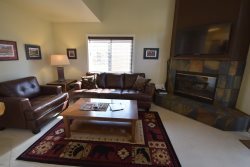 Open living space with a fully equipped kitchen, dinning area and living room featuring a wood burning fireplace. Other amenities include air conditioning, wireless internet, free long distance calls to Canada, large flat screen TV and deeded boat slip that can be rented from the Mountain Harbor Home Owners Association. The master bedroom has a king bed. Second and third bedroom each have a twin over king bunk bed. Mountain Harbor is in a great location on Whitefish Lake; only 6 miles from Whitefish Mountain Resort for Alpine and Nordic Skiing in Winter or in the Summer enjoy hiking, mountain biking, zip lining and more! A 2 mile walk on the new footpath/bicycle path is a very popular way to access Downtown Whitefish for a morning coffee or breakfast at one of the many local restaurants. Fine dining or family dining is in plentiful abundance in Whitefish! You can view our Top Picks by visiting our Local Area Guide for staff suggestions on things to do and places to eat and don't miss visiting Glacier National Park, a short 35 minutes away from Whitefish with all the hiking, biking, water rafting, fly fishing and family fun you could ever dream of.